The weather the last few days has been downright weird (though I should come to expect that around here)! We’ve had everything from sun and 50 degree weather to rain to hail to snow to thundersnow and finally blizzard conditions. So, since everything has been either closed down or completely covered in ice (like my car and the street we live on), I’ve been stuck inside passing time the way I usually do. . .by baking! These white chocolate and lime blondies were first on the list. The subtle, citrusy lime paired with the creamy white chocolate together in a soft, chewy blondie is just what you need to get out of your cold weather doldrums. That is, if you are still freezing in single digit and below zero temps! If you can’t go somewhere warm and tropical, you may as well try and create that feeling as best you can at your home! If you’re not looking for ways to pretend it’s warm outside, you will still find yourself grabbing a white chocolate and lime blondie from the plate every time you pass by. They have just the right amount of sweetness and buttery-ness to make them just about impossible to resist! Preheat oven to 350. Spray an 8x8 or 9x9 inch baking dish with non-stick cooking spray. In the bowl of a stand mixer or with an electric mixer, cream together butter and sugars. Add lime juice, eggs, and vanilla and beat until creamy. In a medium bowl, whisk together flour, lime zest, baking powder, and salt. Add dry ingredients to wet ingredients and beat until combined. Stir in white chocolate chips. Dough will be thick. Spread into the bottom of prepared baking dish. Bake for 20-25 minutes or until just starting to turn golden brown. Do not over bake if you want a gooey bar. If you prefer a more cookie-like texture, bake for the entire time. Allow to cool for 15 minutes before cutting into bars. Love the combo of white chocolate and lime! It’s like a little bite of Summer in one delicious blondie! I love these Jessica-they do make me think of summer! White chocolate and lime are such a perfect pair! I love lime anything! These blondies would be perfect with a cup of coffee!! these look awesome! I bet that lime is super tasty! We’ve had crazy weather too – snow, ice, earthquake – crazy! Ready for spring! Our weather has been up and down here too! Love this fun blondie with the lime and white chocolate. It sounds amazing! 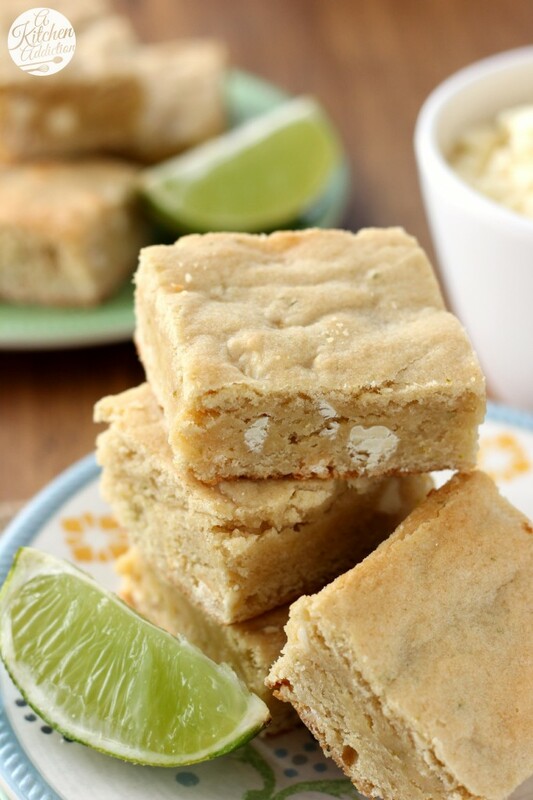 I need these delicious white chocolate and lime blondies right now, I am so sick of this winter and this week its going to be below zero each day! :( Thanks for sharing, pinned! These look delicious, and they definitely would put me in a tropical mood. I need that this week, it is going to be so cold again. After the warm weather we had this weekend in NYC, it just seems cruel to be so cold again! I need some lime blondies! These make me want warm weather! Love the combo of lime and white chocolate! These bars immediately make me think of summer! I love it! And I love the white chocolate-lime combo! Oh man our weather has been bad but nothing like that. I am so sick of the ups and downs. I think we are all in need of a treat like this. I love citrus, so this flavor combation sounds SO intriguing to me. YUM! Great combination! Love how you put citrus in the blondie! so if i was making this, i would have totally used dark chocolate instead of lime, but the more i think about it, the more i want to try these with white chocolate. what a great flavor combo! This is seriously making me wish it was summer! It snowed at my home today and made me wish I had something tropical like these blondies. 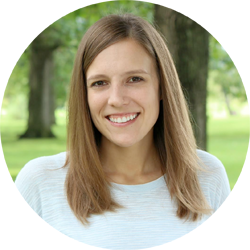 Such a fun and creative idea Jessica! White chocolate and lime are such lovers! These are perfection. I love that these have limes in them. I am so suffering from Spring Fever bigtime! Baking is always a great way to pass the time 😉 These bars look so yummy!! Now these are a cookie I can get down with! Love the flavor combo! I have never made blondies…shameful huh?! Haha gotta love this time of year when the weather shifts..at least it shifts to warmer weather? Maybe? These look awesome, love citrus flavored desserts. This might be a good first blondie to make. Actually it IS a good one to try 😉 Thanks for the recipe! Have a nice week! Sunday we had the doors/windows open. Today, it’s snowing. All I know is that I could use a blondie…this blondie. I love the addition of lime. Anything to brighten up the gray. I love the creative combination! I’ve done a lot of white chocolate and lemon, but never thought of switching it up with lime! Great idea! The weather has been totally bizarre here too! 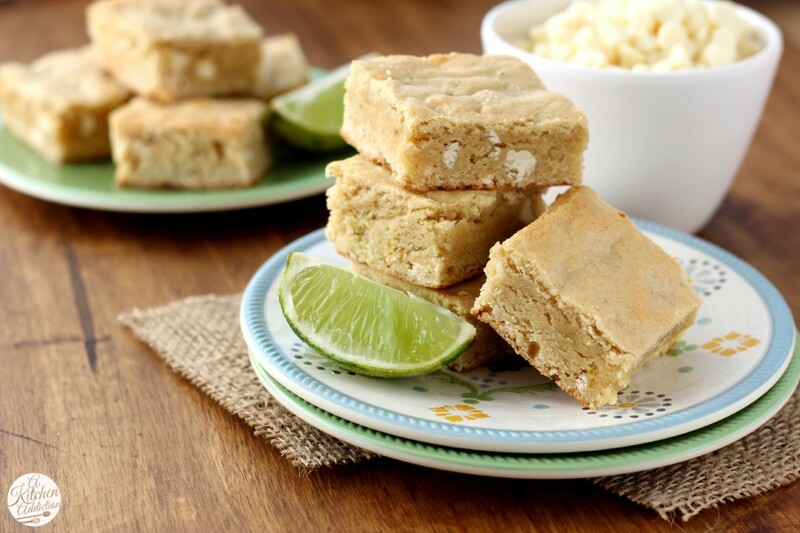 These blondies look so good – love the lime / white chocolate combo you have going on here! I love white chocolate and lime- so good! Definitely might try these blondies, they look super tasty! Our weather has been weird here too and now it’s back to freezing temps again this week. 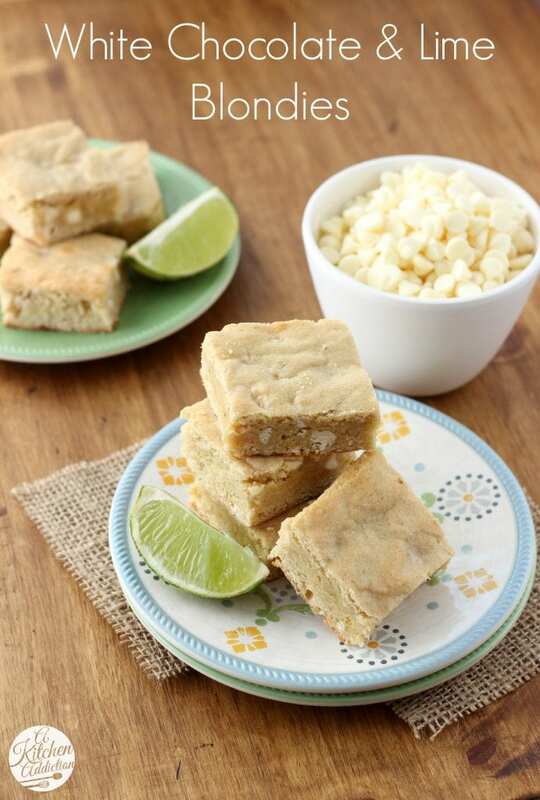 These blondies would totally remind me of summer, love the lime and white chocolate combo here! These scream spring and I’m ready to scream spring and kick that old man winter into next year! YUM! Yes… puhhh–lllease! These sound divine. I would never have thought to throw lime into a blondie! Love it! This is such a fun flavor combination for a blondie! It’s making me dream of Spring 🙂 Pinned! Wow, I love the combination of flavors in this! So creative! These look like a fantastic way to spend the day when you’re cooped up inside. I love the combo of lime and white chocolate, and I love blondies — but I don’t think I would have thought to put the two together. What a great idea! I’m sort of wishing I’ll be snowed in later this week just so I can make these!